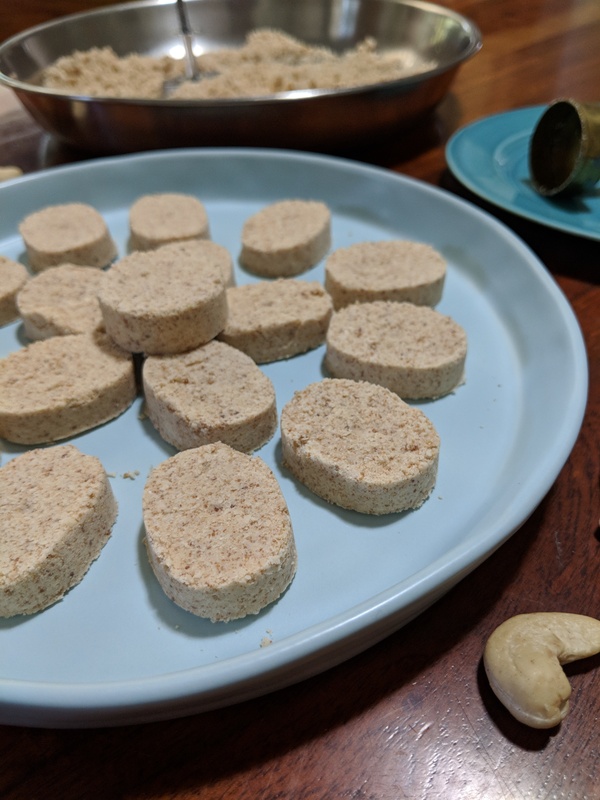 It’s the 2nd week of Recipe Wednesdays here at Veggiebytes! I have been following a lot of principles of Kimberly Snyder’s Beauty Detox Diet since the spring. I’m a super fan and think she’s a sweet yogini. She advocates a plant-based, whole food diet with beauty wisdom from around the world. She encourages proper food combining techniques to optimize digestion, like eating fruits by themselves or before meal. According to Kimberly, if you eat fruit after a heavy meal, say as a dessert, it will ferment and cause digestive distress. She also encourages people to eat some sauerkraut or other probiotic enhancing foods as much as possible. 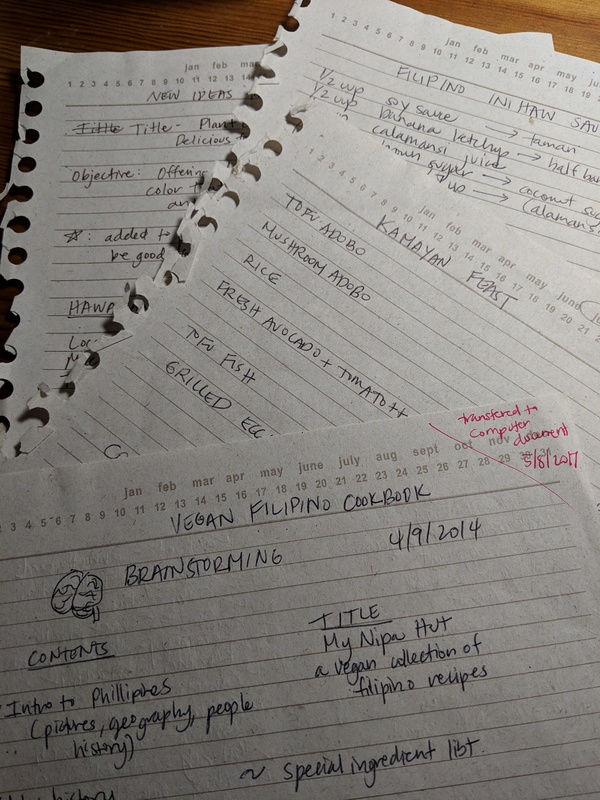 *hint, hint – visit my Fermentation Friday posts*. Another item she suggests is adding seaweed to your diet. I love all kinds of seaweed! Kelp, nori, dulse, arame, wakame, hijiki and more! If you are vegetarian and don’t eat seafood, don’t use iodized salt, and maybe eat a bunch of goitrogenic foods like cruciferous vegetables and soy, adding seaweed will help give you the iodine you need. They are a delicious way to give your meals a salty flavor along with other minerals. 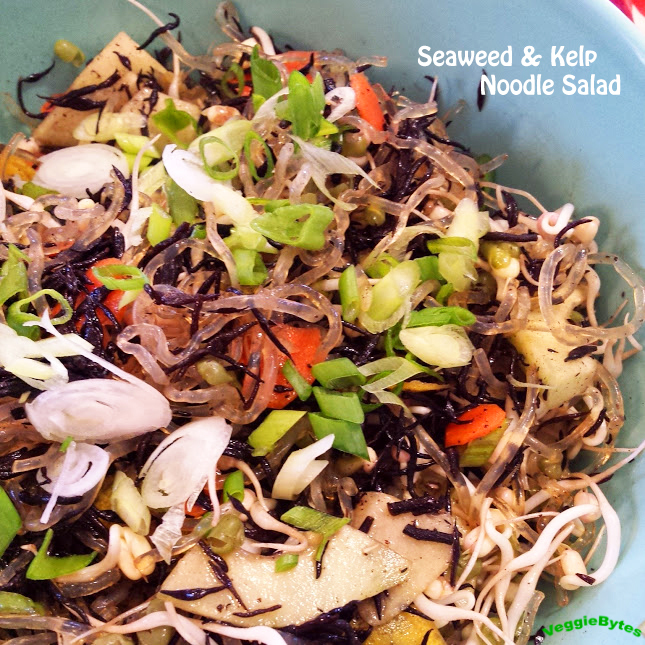 Here are 2 of my favorite salads that include seaweed! First is Kimberly’s Dharma Kale Salad. It includes avocado – LOVE! It just makes everything so much better and is the awesome plant-based fat that is so rich that there is no need to add any oil. The seaweed component is Dulse. A good brand is Maine Coast. It comes from the Atlantic Ocean and is certified organic. You can get it as flakes and sometimes as whole pieces. I like to get whole pieces whenever possible. If you toast dulse pieces in coconut oil, they make a great whole foods bacon substitute. 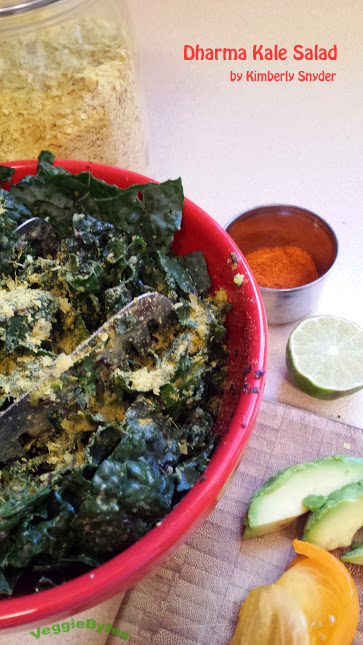 You can watch Kimberly make Dharma’s Kale Salad on YouTube. Here’s my Seaweed and Kelp Noodle Salad! This salad uses kelp noodles. You can find them in the refrigerated section of healthfood stores next to tofu, shiratake, and miso. You can also find them in Asian markets. Hijiki is a sweet tasting seaweed that grows off the coast of Japan and Korea. It usually comes in a shredded dried form. It just requires some soaking time and then it’s ready to be added to any dish. The mung sprouts in this recipe were sprouted at home. Most bean sprouts in the store will be water logged and just not as crunchy at home grown. You can sometimes find these young sprouts in the refrigerated section of an Indian store as they are used in many chaat recipes. Soak and rinse kelp noodles according to the package directions. Soak hijiki in cool water for at least 30 minutes then drain in a colander. In a large bowl, add the noodles, hijiki and all the vegetables and mix. Add the tamari and mirin and mix thoroughly. I hope you enjoy these salads and add more ocean goodness into your meals! See you on Friday! I have never used kelp noodles before but I would love to try – I have eaten them at restaurants and really enjoyed them! Your salad looks like a lovely fresh summer lunch! This is the second recipe I’ve seen this week that calls for kelp noodles (and that I really want to make)! I looked for them in two stores today and haven’t had any luck thusfar, but now I’m on a mission. I love seaweed salads, and this one sounds so good! Good luck on your mission to find them! If you have any large Asian grocery stores in your area you can find them near the tofu and other refrigerated noodles.